Students in the Saturday Morning Creative Drama class develop skills in theatre through imagination, creativity, and exploration. Students in the Saturday Morning Visual Arts class creatively express thoughts and ideas using a variety of materials. Illinois State University College of Fine Arts offers Saturday visual arts and drama classes for children from Kindergarten (5 years old) through eighth grade, September 8-October 6. The Visual Arts program allows students to creatively express thoughts and ideas using a variety of materials and processes, while learning about art and artists from various countries and cultures. This class will be taught from 9-10:50 a.m. and held in the Center for the Visual Arts (CVA) on the ISU campus. 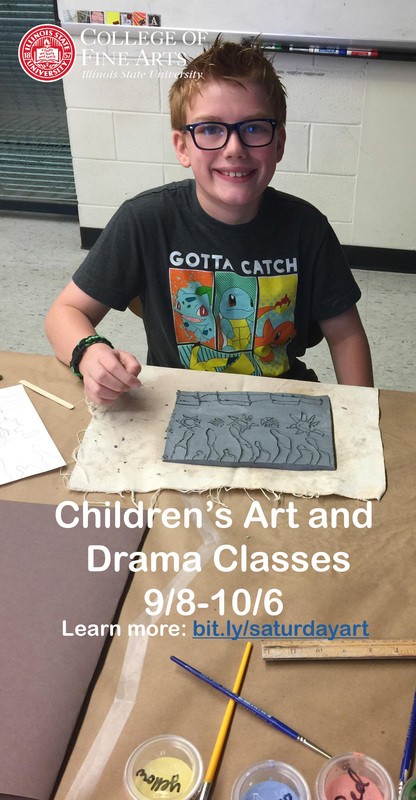 Learn more about the Saturday Visual Arts program. The Creative Drama program develops skills in theatre through imagination, creativity, and exploration while using communication and collaboration abilities. Classes are taught from 11 a.m.-12:15 p.m. with classes for K-first, second-third, and fourth-sixth grades and are held in Centennial West on the ISU campus. Learn more about the Saturday Creative Drama Program. For questions contact Judith Briggs (art) at jabrigg@ilstu.edu or Molly Briggs (drama) at mgbrig2@ilstu.edu. Those who will need accommodations to fully participate in this program please call 309-438-7938.